Portland-based Chimani believes the right technology can lead younger generations back to nature. Those who lament the fact that young people spend less time outdoors than their elders often point to modern technology as the culprit. However, one Portland-based company believes the right technology can bring younger generations back to nature. Those who lament the fact that young people spend less time outdoors than their elders often point to modern technology as the culprit. Chimani, launched in 2010, is developing a series of free mobile apps for national parks and other outdoor attractions that combine the benefits of a map, guidebook and activity planner into one digital package. Chimani’s apps also leverage the global positioning capabilities of smartphones to show users in real time where they are and which points of interest surround them. Investors are starting to take notice. The company closed recently on a $500,000 round of funding from a variety of private and public sources including angel investors and the Maine Technology Institute. Chimani also has hired a number of technology and travel-industry veterans and lured two high-tech heavyweights from Facebook and Yelp! to join its advisory board. Chimani co-founder and CEO Kerry Gallivan says he is actively seeking a second, larger funding round to expand the company’s product line to cover more outdoor destinations, both domestic and international. He believes apps ultimately will supplant paper travel guides and inspire the next generation of park enthusiasts. So far, consumers have voiced their agreement by downloading about 700,000 copies of Chimani’s apps. “I knew there was going to be a shift from people buying these items to wanting to have this stuff already on their mobile device,” Gallivan said. One essential feature of the app is that it remains fully functional in areas with no phone or data connectivity. All of the content is preloaded on the mobile device, and the GPS functions still work in mobile network “dark spots,” of which most national parks have many. Each app is specific to a particular destination and provides several tools, including a map, “augmented reality” viewer and guides to various activities. 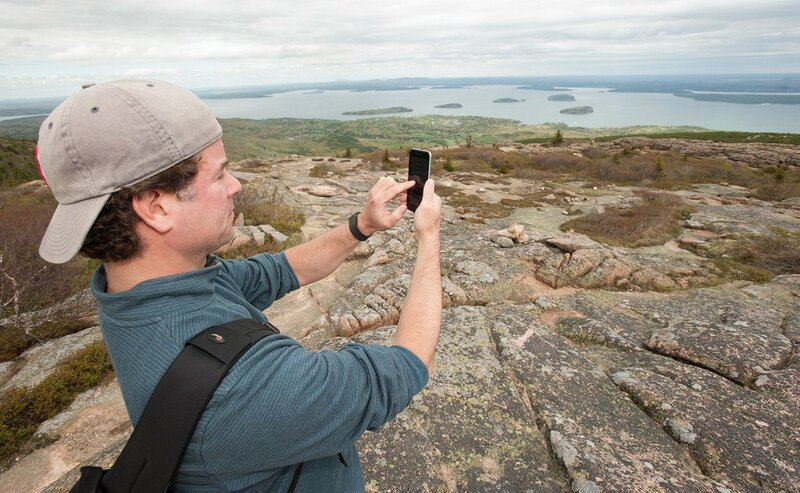 The first app Chimani developed is for Acadia National Park. It shows users where to go for hiking, bicycling, camping, boating, swimming, horseback riding, fishing and other activities. It also advises users of the best times to visit each spot, based on factors such as tides and position of the sun. The augmented reality viewer overlays points of interest on the actual landscape, as seen through a mobile device’s camera, from the spot where the user is standing. Tapping on a point of interest brings up a screen with more information about it. “It’s really good content, as well as good technology,” Gallivan said about the apps. The name Chimani is short for the Chimanimani Mountains National Park in Zimbabwe. In 1992, Gallivan was finishing an internship with the Southern African Development Centre in Harare, Zimbabwe, when he learned about an Outward Bound center located in the Chimanimani Mountains. A New England native and avid outdoorsman, Gallivan said he ended up taking an Outward Bound course, and years later the park’s nickname, Chimani, stuck with him. Gallivan said he registered the Chimani.com domain name in 1998 without knowing what he might use it for. In 2009, while camping in Acadia’s Blackwoods Campground, Gallivan came up with the idea to develop digital park guides. It was early April, and there was still snow on the ground, he said. Hoping to find some information about trails, Gallivan took out his first-generation iPhone and attempted to Google it. The apps are designed for casual outdoor tourists and not for what Gallivan calls “Red Bull enthusiasts.” They are easy to use and provide a broad overview of each park. Each app also can be used in the planning phase of a park visit – it recommends specific activities and attractions to users based on their particular interests, ascertained through a brief, in-app survey. So far, Chimani has developed apps for 14 of the nation’s 59 national parks, including Acadia, Bryce Canyon in Utah, Grand Canyon in Arizona and Yellowstone in Wyoming, Montana and Idaho. In addition to visiting parks to develop his apps, Gallivan has embarked on an adventure of a different sort: trying to figure out how to make money from them. The company initially charged $9.99 per app, but Gallivan said that model proved to be a failure. “If it’s content-related, they want it for free,” he said. So the company shifted to a model in which it gives away the apps, available for both Android and Apple devices, and makes its money selling in-app sponsorships to companies that want to target park-goers. Subaru is now a major sponsor, and other deals are in the works. Users see sponsors’ ads while using certain features of the app. No personal information or user registration is required, although Gallivan said the company does collect metadata about app usage to show to prospective sponsors. The first week Chimani decided to give away its apps for free, the company’s installed user base went from 6,000 to 120,000, he said. The company’s largest demographic is users 65 and older, followed by those in the 35-55 range. Gallivan said the company is developing additional tools that are specifically targeted at a younger audience, such as a “virtual passport” that digitally stamps each park when a user visits it, and a video game-style achievement system in which users receive digital “badges” for finding park monuments. The system uses GPS in a similar manner to the popular hobby known as geocaching, in which participants seek out hidden items left behind by others. Chimani is not affiliated with the National Park Service, but it does work together with individual parks when developing an app, Gallivan said. “We have them review it before it goes live,” he said. The company also seeks out what Gallivan calls “brand ambassadors” among park-area businesses whose customers might benefit from using the app. Jane Holland, owner of Aysgarth Station Bed & Breakfast in Bar Harbor, said she recommended Chimani’s Acadia app to one of her guests, who used it to find his way back to the road after getting lost in the snow. Holland said she recommends the app even though her business doesn’t receive any money for it, because it enhances her guests’ experience and increases their chances of returning. It is especially good for young people steeped in technology, she said. “In today’s age, honestly, you give a (paper) map to some younger people, and they can’t make heads or tails of it,” Holland said.